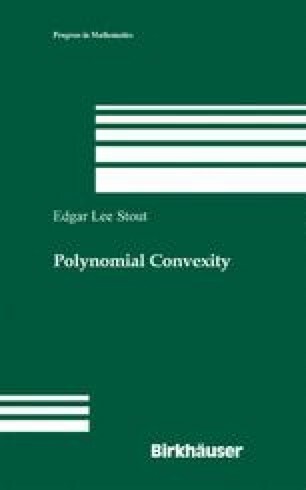 This chapter is devoted to a fairly self-contained discussion of the polynomially convex hull of a connected set of finite length or, more generally, a set that is contained in a connected set of finite length. One result that finally emerges in this chapter is that each rectifiable arc in ℂN is polynomially convex. Much of the chapter is devoted to preliminaries from classical function theory and from real analysis. Section 3.1 contains a statement of one of the principal results of the chapter and some remarks about it. Section 3.2 assembles well-known information about one-dimensional analytic varieties. Section 3.3 contains geometric preliminaries concerning Hausdorff measures, integration, and sets of finite length. Section 3.4 is devoted to some essential results on conformal mapping and related issues. Section 3.5 establishes the subharmonicity of certain functions naturally associated with the polynomially convex hull of a compact set. Section 3.6 shows that the polynomially convex hull of a connected set of finite length is a one-dimensional variety. Section 3.7 shows that this hull has finite area. Section 3.8 applies the preceding theory to the continuation of one-dimensional varieties and, vice versa, this theory of continuation to the study of hulls.